"Through a long and distinguished career as one of the world's leading horn players, as a professor and celebrated cultural personality, Frøydis's work has been of tremendous value to the art of horn playing and its repertoire of contemporary music. Her distinctive tone and communicative abilities have captured audiences and composers all over the world, and numerous works have been written especially for her." Frøydis Ree Wekre was born in 1941 in Oslo into a musical family. She studied piano and violin (playing in the Norwegian Broadcasting Junior Orchestra) before taking up horn at the age of 17, having become fascinated by the sound of the horn and the idea of having her own voice in the orchestra. Her horn studies continued in Sweden, Russia, and the US. Her principal teachers were Wilhelm Lanzky-Otto and Vitali Bujanovsky. Frøydis first won a position with the Norwegian Opera Orchestra, then in 1961 she joined the Oslo Philharmonic and became co-principal in 1965. In 1991, she retired from the orchestra to be professor of horn and wind chamber music at the Norwegian Academy of Music, where she already held a part-time position. Her role as a teacher has been important to Frøydis, and dozens of her students play in major orchestras around the world. She has been offered professorships in several countries. She received the Lindeman Prize in 1986 for her contributions as a teacher. With Nordic colleagues, she started the NORDHORNPED teaching group, whose activities include studying their own teaching on video. With Academy colleagues, she has been forging connections with music conservatories in the US. Renowned as both teacher and performer, Frøydis has given master classes and workshops throughout Europe and North America. Her book On Playing the Horn Well has been translated into several languages, and she has contributed articles to various publications, including The Horn Call. Sometimes she demonstrates playing a scale with the main tuning slides pushed all the way in, then pulled all the way out; the scale is in tune at A=440 in both instances, showing that you can play in tune no matter the horn. She advocates practicing lip and mouthpiece buzzing while waiting for a bus, even if it might be considered a bit eccentric; "If people don't know you, it doesn't matter what they think of you, and if they do know you, well, then it's not a surprise." Her CDs showcase her talents and include many works that have been dedicated to her or that she has commissioned, notably works by Andrea Clearfield and Norwegian composers such as Trygve Madsen and Wolfgang Plagge. Frøydis is named after an Icelandic saga character; in the midst of war, her mother wanted to give her the name of a strong person. Her name is now instantly recognized in the horn world, and she prefers to be addressed by her given name. In 1973, Frøydis sponsored IHS memberships for Peter Damm and Vitaly Bujanovsky, both of whom lived behind the Iron Curtain and were unable to send membership dues to the US. In 1976 the effort became formalized into the WestEast (WE) project (renamed the Friendship Project in 2000) to support members in countries where the economy or currency restrictions make regular memberships impossible. 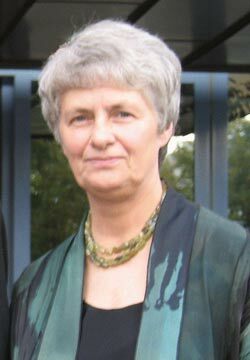 Frøydis served on the IHS Advisory Council from 1974-1978 and 1993-2000 and as IHS President from 1998-2000, and she was appointed an IHS Honorary Member in 1994. She was co-host of the International Horn Symposium in Banff in 1998 and has participated in symposiums from the earliest days as performer, lecturer, and master, often humorous and always inspiring. She is famous for her whistling prowess, a highlight at otherwise business-like IHS General Meetings.